Hi, I am Mohd Abdu & I came from Makelle, Ethiopia for my Renal Transplant. I was suffering from 5 years from the same and I am very happy to come here to Fortis Hospital. The doctor's are excellent and the nursing staff is also very caring. The hospitality in Fortis is excellent and I will certainly recommend others to come to Fortis. J. L. H. from USA flew to Fortis Hospital Noida for Meniscule Repair & ACL Repair both Orthopaedics surgeries on 10th April 2007. The operation was performed by Dr Ashok Rajgopal, Director, Department of Orthopaedics. surgeries on 10th April 2007. The operation was performed by Dr Ashok Rajgopal, Director, Department of Orthopaedics. J. L. H. stayed at the hospital for two days and post surgery spent 5 days before he flew back home. J.L.H. said "Everyone around me was very nice and helpful"
President of an IT firm and an American Afghan based at Kabul, Mr. Tamim Samee came to Fortis Healthcare flt. Lt. Rajan Dhall Hospital to undergo a Laparoscopic Inguinal Hernioplasty. Operated upon by Dr. Paritosh. S. Gupta, Mr. Samee spent three days at the Hospital. At the end of his third day, Mr. Samee said "I am extremely pleased with the experience in Flt. Lt. Rajan Dhall Hospital. All services were prompt & of an international quality. I would definitely recommend this hospital to my family & friends". 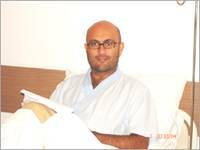 I am from Sri Lanka, getting my treatment done under Dr. Upendra Kaul, the cardiologist. I came to India and got admitted in Fortis Healthcare, Noida on 31st August, 2005. The facilities provided by the hospital are appreciable. Doctors, Nurses and other staff are very cordial in discharging their responsibilities and it is a real consolation for a patient like me who has come from a foreign country. Special mention should be made of the Guest Relation Officer who impressed me very much with her friendly attitude. She was very prompt in providing the facilities I requested from her. Her superb communication skill will be an asset to this institution. Mr. Charles Kaiser, a 62 year old retired professor from the United States of America underwent two neurosurgery procedures (Cervical Corpectomy & Fusion and Lumbar Posterior fusion-2 levels) on the 6th and 11th of January respectively. The procedures were performed by Dr. A. K. Singh, Director Neurosciences, Fortis Hospital, Noida. Mr. Kaiser said "Doctors in Fortis Healthcare are highly professional and were always reassuring. The Nurses, Physiotherapist and the Housekeeping people were extraordinary. Everybody goes a step out of their way and everything has an element of personal touch. Food was excellent and was available when ever it was asked for. This kind of personal care cannot be expected in USA". We were quoted between US $ 85,000 to US $ 100,000 for the surgeries in the US and in Fortis Healthcare noida - including a round trip to Agra, Jaipur and Neemrana Fort - it was under US $ 12,000. My pain has reduced substantially post surgery and Dr A K Singh has given me the reassurance that I could call him whenever I want to. Overall, Fortis Healthcare was outstanding in all ways.right from the welcome bouquet at the Airport to the warm sendoff. A real memorable experience to treasure."